The following are core values deeply held by the Pinnacle Association Board, and are integral to how we conduct ourselves in endeavoring to fulfill the mission. Trust is built in relationships by working with integrity, honesty, following through with professionalism, avoiding conflict of interest, and by being friendly, respectful, helpful, positive, and listening carefully to each other and the community. Communication that enhances the connection of people to the land is effective and important. Projects are viewed within the context of the larger picture, and we are willing to compromise and collaborate for long-term conservation and healthy ecosystem stewardship. We work to ensure the sustainability of the organization in stewardship practices for the land, finances, healthy Board dynamics, community support, and cultivating future generations to connect passionately with this land. We challenge our knowledge, evaluate new concepts, and stretch our thinking to achieve our mission and goals. We manage the land with gratitude and appreciation for the biodiversity of nature and seek wisdom in balancing the needs of humans and natural habitats, with respect and consideration for scientific evidence. Our priority is to conserve land with a long-term stewardship ethic, because ecosystems that include unfragmented habitats enhance the quality of life for all living organisms. People are responsible for conservation, therefore we engage, honor, and nurture people’s passion for the natural world by inspiring, educating, and providing safe, joyful experiences for all people who engage with this land. We believe that all people regardless of income, race, gender, livelihood, religious beliefs, or politics deserve to have access to a healthy relationship with the land. 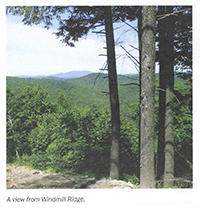 Arthur and Carol Westing have worked for years to protect the Windmill Ridge and to introduce it and its features to others. 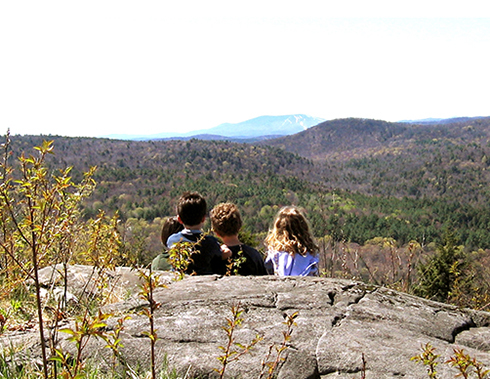 Click here to read Arthur’s statement about his very special place as featured in the Spring 2017 edition of the Vermont Land Trust newsletter (pdf 808kb).